My author is MIA this morning, so we’re just going to leap right into the interview with Young Adult author Cate Dean. 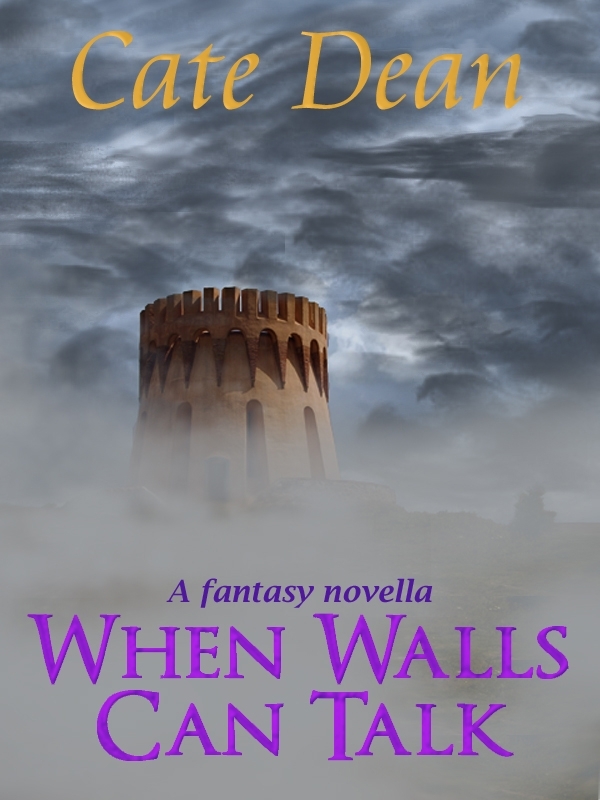 But before the questions, a little about her novella, When Walls Can Talk. Hi, Kate. I love the idea of a haunted castle! Your Muse must be doing a great job inspiring you. What’s the next project they’re helping you out on? Funny you should ask. My next project involves a guardian angel, name of Jackson Poole. Maybe you’ve seen him – he’s been there a while, since he has failed at every assignment he’s been given so far – tall, dark hair, grey-green eyes, a bit of a charmer . . .
No, I haven’t met him, but it sounds like maybe we have a few things in common…which, actually makes me wonder, which of your characters are you most like? I am most like Shane, one of the main characters in my YA book coming out this summer. She is fiercely protective, a little too impulsive, and takeslife head on – no matter what it throws at her. And it throws buckets. Hmm…come to think of it, Shane sounds a little like me too. I need to warn you – the next question is not popular. What’s your favorite book of all time? Oh, that’s a tough one – but I will go with A Wrinkle in Time, by Madeleine L’Engle. My fifth grade teacher read it to the class, and it introduced me to fantasy/sci fi. I still have my well-read copy. Yes! That is one awesome books for kids. Okay, were gonna do a 180 degree turn on the topic here. In your opinion what makes a guy character swoony-worthy? He has to be funny, hands down. And caring, and considerate of other people. And adventurous, and willing to take a risk. Oh, and blue eyes and dark hair wouldn’t hurt, either. Adventurous is excellent! And do you know what would be a great adventure? A rock concert in Heaven, that’s what! If you could go to one, who would you want to see? Buddy Holly and Elvis sharing the headline, with John Bonham on drums now that would rock! Confession time! What’s your biggest writing sin? Awww…Heaven says, “You are welcome, Cate Dean. 😀 So tell me, are you more of a rule follower or a rebel? Why? I am a rebel – always have been. It’s the reason I chose to go indie. I’m a rebel too! And by indie, you mean independent, right? Do you think ‘cause I skipped school and went straight to Earth that that’s kinda indie too? ‘Cause I do. Anyhow…other than rebellion and your Muse, what inspires you? My travels, more than anything. I go to England on a regular basis, and I’ve been to Australia, Scotland, Ireland, and most of the US. But I am really inspired by what I see, experience, and feel when I’m traveling in England. There is so much about that place that speaks to my heart. Things that speak to your heart are important when you speak from your heart. That’s my Angelic advice for today. 🙂 So, what does your heart want readers to take away from your books? That we can all make a difference, no matter how small. That we are special, and that we matter. That’s one of the reasons I write more YA than any other genre. With four nephews, I want to shout those – in my books, I can weave them into a story, and give the reader a chance to take that into their real life. Aww…that is really sweet. And kinda’ Guardian-ish. Is there anything you’d like me to mention to your Guardian? I’ll put in a good word for you. Excellent! Can you tell him I’m going to be needing all of his attention? Because I have big plans ahead, and I need to know he’s got my back. Okay, but you should know. He or she is supposed to have your back ALL THE TIME. Still, I’ll let them know. To be honest, I’m pretty much in shock about how reliable she’s been, but we have a lot more great inteviews coming up, including James Todd Cochrane tomorrow. April 24, 2012. Tags: author interview, Cater Dean, confessions., guardian angel, Shel Delisle, When Walls Can Talk, Winging It!. author interviews. Thanks for having me here today! I enjoyed hanging out with you. April 24, 2012 at 2:49 pm. Permalink. April 24, 2012 at 9:25 pm. Permalink. April 25, 2012 at 1:20 am. Permalink.